Do you want to battle the forces of evil? Are you filled with the desire to save the world? Would spandex and a cape look really good on you? If so, then it's time for you to don your costume, fight for justice, and create your secret identity with the superhero name generator! Ever since Superman made his first appearance in Action Comics issue #1 in June 1938, the world of superheroes has exploded with life, and thousands of costumed adventurers have appeared in comics and a multitude of other media. Many early superheroes were heavily influenced by pulp fiction characters of the 1930s like Doc Savage and the Shadow, and their characteristics and names worked their way into the DNA of superheroes. With all the decades of superheroes that have passed, going from the 'Golden Age' of the 1940s with Batman, Captain America, Wonder Woman and the original Green Lantern, to the 'Silver Age' of the 1950s and 60s, with the Flash, the Fantastic Four and the Amazing Spider-Man, some specific conventions for hero names have evolved, and we've done our best to follow these strange and surreal rules when constructing our hero name generator. The way the name sounds when you say it is highly important to the impact it will have. 'K', 'V' and 'X' all give a harsh sound to names, while 'F', 'B', 'G' and 'M' also can give a name plenty of impact in the right place. Stressed syllables can also give added emphasis, especially when your name is being shouted dramatically by a villain! Along with colour, one of the prime ways of creating strong and memorable names is to find a noun that's just sitting around doing nothing, and make it yours! It can be something attention-grabbing like the Flash or Falcon or the Thing, something mysterious like Raven or the Vision, or something more descriptive like Domino or Cable! If you want to get really exciting with your names, adjectives are the way to go. Take a word that's usually put in front of something else to make it clear how exciting it is – like Superior, Supreme, Marvel, Fantastic, or Incredible – and you can either use it on its own, or combine it with a 'Captain', a 'Professor' or a simple 'Ms' or 'Mr' to create a name that won't be easily forgotten! Talking of 'Dr' or 'Mr' – titles are also an instant way to add class to your name. They're very much a throwback to the pulp heroes of the 1920s and the 1930s, but names like Mr Fantastic, Doctor Strange, Mr Terrific or Captain Marvel have a sense of authority and impact that can't be beaten. Another way to give a name a sense of style and identity is to use a word or phrase that's already familiar. Two-syllable words or phrases are often the best – plenty of heroes have gone this route, whether it's Daredevil, Firestorm, Hawkeye, Magneto, Nova or Northstar, and there are always new and unusual phrases waiting to be turned into names! The classic name structure goes all the way back to Jerry Siegel and Joe Shuster's work in Action Comics #1, where they took the adjective 'Super' and stuck it together with 'man'. Since then, it's become the most recognizable way of saying 'I'm here, I've got very specific skills or abilities, and I'm fighting for justice!' with such examples as Batman, Aquaman, Catwoman, Deadman, Elongated Man, Hawkman, Invisible Woman, and – of course – Spider-Man. Sometimes a superhero doesn't need a secret identity, especially when they've already got an impressive name. There are plenty of superheroes over the years who have proper, given names – from Adam Strange and Jenny Sparks to Emma Frost and Luke Cage (even if his is technically an alias). Plus, superheroes (and some supervillains) even have distinctive names in their average, day-to-day lives, with the biggest giveaway being the alliterative name. From Peter Parker and Stephen Strange to Wade Wilson, alliteration is often the name of the game! 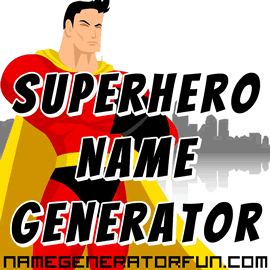 There are a variety of character name types in our superhero name generator – sometimes you'll get colour-related names, sometimes you'll get titles, and sometimes you'll get more specific, descriptive names that connect directly to superpowers. In order to give each name the maximum amount of colour, we've ensured that each name has a matching set of superpowers, and we've also added a number of extra stats, including an origin story, a home city, and a specific supervillain to fight. We've tried to pull from all across superhero history for the various origin stories (going from pulpy vengeance-related origins to more kooky science-based adventures), and one of our prime inspirations were the off-beat, frequently surreal tales from the 'Silver Age' of comics in the 1950s and 1960s, when superheroes were always battling strange aliens, mind-bending forces, and exceedingly cunning gorillas! We hope that you enjoy the end result, and that the superhero names you create here can help fire your imagination and send you off on your next quest to save the world! If you enjoyed this page, you might also enjoy our supervillain names. Disclaimer: this is a fan commentary page intended to encourage interest in superheroes. This page is not an official publication and is not in any way affiliated with or endorsed by DC, Marvel Comics, or any of their licensees. Copyrights and trademarks for the books, films, articles, and other promotional materials are held by their respective owners and their reference is allowed under the fair use clause of copyright law. The extremely limited use of the word "superhero" is in no way intended to harm or undermine the market value of trademarked works, rather to encourage fans to engage with and seek out those works. Last Updated: 24th January 2019.